A group of immigrants arrived on the shores of Quebec aboard The John Mackenzie. It had sailed from Scotland, its passengers full of anticipation and excitement, the date June 26, 1857. The 250 passengers upon their arrival to Quebec City disembarked only to find their way onboard The Montreal, heading to the next stop on their journey, Montreal. There were up to 300 passengers onboard The Montreal when a fire broke out near the boiler. The two lifeboats quickly filled and were swamped. With limited choices, people remained onboard as long as possible before jumping in the water, many ended up with severe burns. It is estimated 248 people died in the incident. I came across information on The Montreal when researching a relative, Robert Andrew Jeffrey. Robert is mentioned in the newspaper as he helped in the recovery of the bodies. What an incredibly grim task. The victims were mostly laid to rest in Quebec City. The newspaper was accessed through the BAnQ website where the full article can be found. Robert Jeffery lived until he was 69 years old, and during his lifetime he was married three times and had twenty children. Robert was one of three sons born to Robert Jeffery and Elizabeth Tipper, he was the only one to have children, and have them he did. Robert’s first marriage was to Delphine Guenet at Notre Dame Cathedral in Quebec City. A Catholic marriage meant a change for the Scottish Presbyterian Jeffery family. Dephine gave Robert five children, only three survived infancy. Delphine died in 1855 and Robert married again. His next wife was Sara Duclos, they signed a marriage contract in May of 1856. Their marriage took place in the Catholic Church in Lévis, Quebec. Six children were born to the couple with only four that survived infancy. In 1862 tragedy struck the family, when son Antoine drowned. I wonder if Joseph Dube who also died from drowning was with Antoine on that sad day. Antoine was Robert’s son from his first marriage. There are a few mentions of Robert in the Quebec Gazette, which is useful in understanding his financial situation. The description below mentions where his land was located. The second clipping from the Quebec Gazette is a judgement against him and sale of his land. city Robert Jeffery, Quebec Gazette 7 Dec 1878. Sara Duclos Jeffery died in 1872 leaving Robert with seven children. In the space of a couple of months, Robert marries his third bride, Odile Brousseau. Together they had nine children and I have found that two of their children died at a young age. This would mean in 1886 when their last child was born Robert potentially had fourteen children living, likely his oldest children had moved on to households of their own. When Robert’s last child was born he was 59 years old! In his lifetime Robert was a boatman, but I am not sure in what capacity. I picture him shipping product for merchants between Quebec City and Lévis but I am unsure at this point if that was the nature of his work. There are numerous Notary records referring to Robert, many of the documents refer to business deals, leases and sales. I did find one Notary record dated 1873 (in English) in which Robert promises his sons Francois-Xavier, George & Robert Andrew that the deed he is signing will be ratified when they come of age. I am sure more treasures will be found when I focus on this area of my research. Robert died at the age of 69 in 1897 and is buried in Beechwood Cemetery, Quebec. Many of Robert’s children left Quebec and settled in, Maine, Massachusetts and other locations in the USA. This is the second part in a series I am writing on the Jeffery sisters. 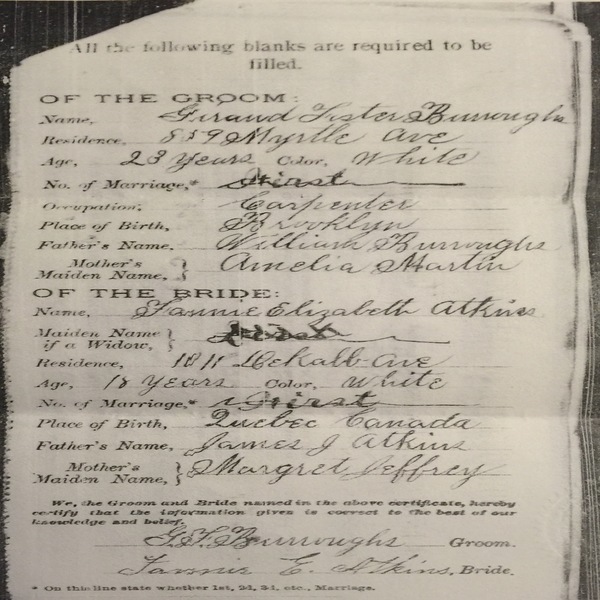 When I first started researching the Jeffery family I had no idea how I would be drawn to Margaret’s story, it may be because I was able to learn many details about the trials in her life, which was possible with the release of the Quebec Notary records on Ancestry. With the help of Ancestry, I was able to uncover details of Margaret’s life that had long been forgotten. Margaret Stock[w]ell Jeffery was born 1832 to parents Robert and Elizabeth Tipper. Margaret was their fifth child, with only two of her older siblings still living. Margaret was baptized Nov. 1, 1832, in St. Andrew’s Church, Quebec City and lived in that city for most of her youth. At the age of seventeen, she married an Englishman, George Grey Humphry who was Captain of the aptly named ship The Margaret. After doing some digging I discovered that after her marriage Margaret moved to Devon, England, the home of her husband. A journey across the sea to a new life, I can picture Margaret standing onboard the ship with her face in the wind sailing towards her future. Screenshot highlighting the distance between Quebec City and Totnes, Devon. I think the journey would have been quite a bit longer by boat in 1847. Their first child was George who arrived in 1851 but died the following year. The next two children were daughters, Emily arrived in 1854 and Margaret Adelaide (aka Addie) in 1856. Two years later the girls were baptized at St. Andrew’s Church back in Canada. Why did they return? The baptism record answers that question, Margaret was a widow and why George died has yet to be discovered. Times were tough for a single mother with limited ways of earning an income. 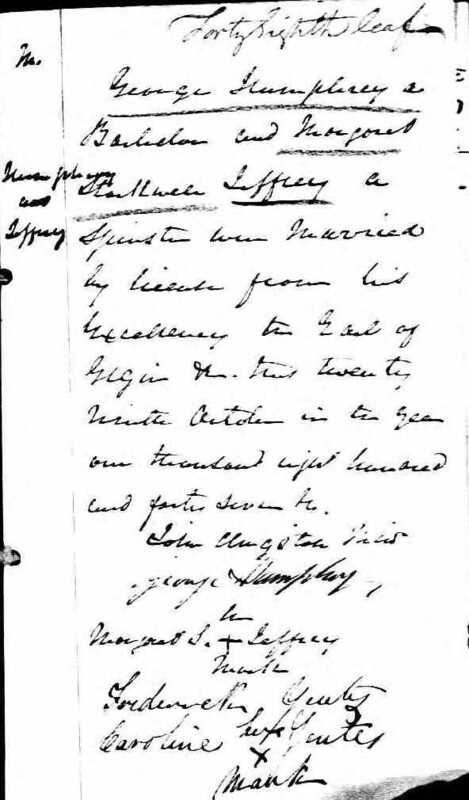 In 1859 Margaret gave up the right to raise her girls, Notary Leon Roy (document No. 2618), drew up the agreement between her and La communauté des Soeurs de la Charité (Sisters of Charity Community) also commonly referred to as the Grey Nuns (Soeurs Grises) . At the time Emily and Addie were only five and three years old. A moment that would tear at any parent’s heart. In 1861 while at the Hotel Dieu Hospital in Quebec City Margaret is again meeting with a Notary. This time she is moving the girls to the Ladies Protestant Home of Quebec. This home was located at 95 Grande Allée Ouest. I am not sure why she would move the girls from one institution to another, one possibility is the Ladies Home was newly established. The document also states that the girls will be provided with clothing, lodging, education and medical attention as needed as per “their station in life”. Their religious education will follow the doctrine of the Church of England and they will conform and comply with the rules and regulations of the institution. The girls were ages five and three. 1864 brings hope when Margaret walks down the aisle a second time. Her husband is James Atkins from Ohio, a civil war veteran. 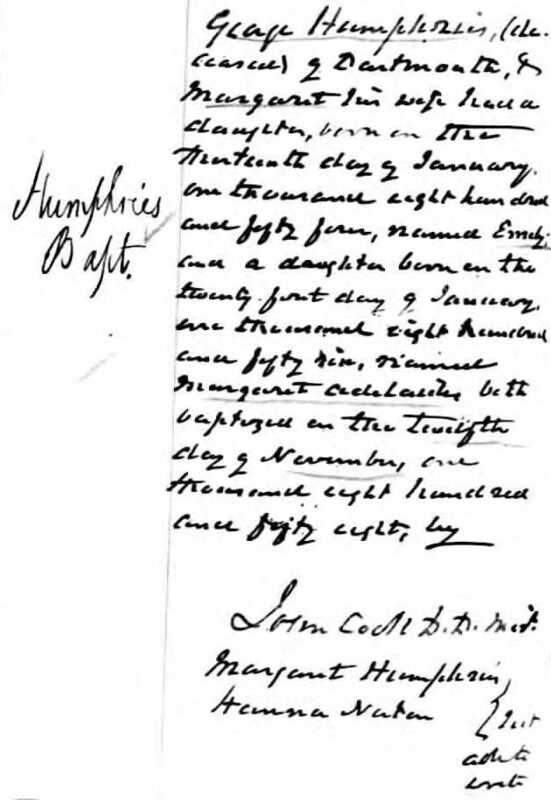 Three children are born to the couple, daughter Fannie and son Henry in Montreal and after a move to New Jersey, daughter Lillie is born. You may wonder what happened to the Humphry girls, Margaret was able to return to the Home and claim them once and for all. The joy that day must have been overwhelming for all of them. The Atkins family eventually settles in New York where they are all found on the 1875 census with James working as a printer. Emily is noticeably absent from the household, she married the same year to Constantine Philips, also a printer. The happiness for Margaret doesn’t last, three years later she dies in New York, making her time with her family fleeting and so precious. James Atkins marries again, another girl from Quebec, Esther Martin. The Atkins family makes a final move to San Juan, Washington which is where James dies in 1900. With some research I have found descendants of Margaret’s, her story had been lost to them over time. 2. This document was in French and I am grateful to expert Sharron Callaghan for her help in interpreting it as well as offering an understandable interpretation of the legal jargon. I am continually grateful for her assistance in my Quebec research. There always so much to see when I travel to Quebec City and I made a point to visit some places that I knew were frequented by my ancestors. Before leaving I created a list of places to visit and on the list was the Jeffery family home in the 1840s. Robert and Elizabeth (Tipper) Jeffery lived at 43 Ursule Street in the 1840s-1853 with their children. Robert was arrested for domestic violence and ended up in jail, I am not sure what happened to him when he got out but he does not come back and live with Elizabeth. Elizabeth opened up a boarding house at 45 Ursule Street and passes away in 1853 and her daughter who was living with her relocates to New York. Here I am outside her home which is now the Hotel Acadia and is advertised as “cozy rooms in a 19th-century townhouse”. The location of where Elizabeth’s home was in Quebec City. It is quite close to many tourist sites.